I just finished viewing one of the most powerful five-minute video clips I have ever watched. The video features Tom Satterly who retired from the United States Army as a Master Sergeant after many years of service as a Delta Force Special Operator. Master Sergeant Satterly was awarded six Bronze Stars for his service in combat in four countries. His first exposure to combat was an 18-hour firefight in Mogadishu and was depicted in the movie Black Hawk Down. At the time, this was the longest sustained continuous gun battle for American soldiers since the Vietnam War. If you have read Staying Alive – How To Survive Deadly Encounters, you likely recall that Satterly was directly involved with the captures of both Manuel Noriega and Saddam Hussein. In his new video, Master Sergeant Satterly delivers a powerful and much-needed message about how important it is for people not to fail to try when confronted with opportunity, challenges and even the seemingly overwhelming odds of survival. Master Sergeant Satterly’s new video is even more powerful and valuable. I urge you to take five minutes to hear a powerful and important message by watching this video I can assure you that you will find the segment to be worth your time. Staying Alive – Combat and Lessons for Every Day Crisis Stress from Safe Havens International on Vimeo. Feedback from visitors to our website has been that these compelling videos have been helpful to many educators and public safety officials from around the world. Master Sergeant Satterly is scheduled to testify before the United States Congress on the topics of Post Traumatic Stress Disorder and how our military can better serve those like him who have allowed the rest of us to enjoy the freedom and safety that is truly unique in contrast with other democracies let alone the majority of nations. I am thankful to Tom Satterly and the thousands of other brave men and women who serve as soldiers, police officers, firefighters, security personnel, mental health professionals, educators and other selfless professionals who sacrifice in different ways to make our world a better place. Master Sergeant Satterly’s powerful message reminds us that we can achieve much as long as we do not fail to try. 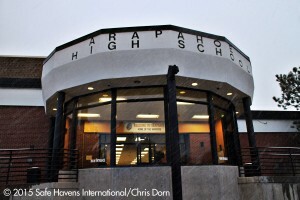 As outlined in a blog last week and reported in Campus Safety Magazine, Safe Havens International conducted a pro bono independent review of the active shooter incident that occurred at Arapaho High School in Littleton, Colorado in 2013. This review was conducted as part of an arbitration process agreed to by the Littleton Public School District (LPS) and the parents of Arapaho High School student Claire Davis, who was killed in the attack. I presented the findings of our team to the Littleton Public School Board last Thursday. Dr. Linda Kanan and Dr. John Nicolletti also presented to the board on a separate report they prepared with the assistance of Dr. Sara Gorrido and Mariya Dvoskina. This meeting was followed by a press conference. The following day, we presented our findings to a subcommittee of the Colorado Legislature at the State Capitol. Two experts who conducted a review for the Davis family also presented their findings to the committee. The well-attended hearing lasted four and a half hours. A major focus of the post-incident reviews were on student threat evaluation and why no students used state’s Safe2Tell anonymous reporting line even though the school participated in this program at the time of the shooting. During this process, Dr. Kanan has mentioned to me that there is a dangerous tendency for people to try to boil school shootings down into overly simplified concepts. I agree with her concerns. One important caution in the Safe Havens report involved the need to look comprehensively at the prevention of active shooter incidents. While these two topical areas are clearly important and were among a number of important aspects of this particular case, we cautioned that a number of active shooter events at K12 schools did not involved currently enrolled students. For example, two of the nation’s three most deadly K12 school shootings to date involved attackers who were not currently enrolled students at the time of their attacks. As these three attacks account for roughly 70% of all homicides by active shooter deaths in K12 schools in the United States from 1998 to 2013, it is important to remember that prevention strategies must address outside aggressors as well as student attackers. An over-reliance on only a few prevention strategies can leave gaps that are easily exploited by future attackers. The unique arbitration process will help educators, mental health professionals, school safety practitioners and legislators better understand how this tragedy occurred. There were some points of agreement between the three evaluation teams as well as some very significant differences. When carefully read, the reports can also shed light into ways to enhance our ability to try to prevent future school attacks. We hope that those how are concerned about school violence prevention will learn from this process. For more on designing emergency maps, including information on prepping your maps for color-blindness, read our September 2015 issue of School Safety Monthly.